Yesterday, a big fat rabbit was eating some of my tomatoes. As I was washing dishes after dinner, my husband, Jim, came walking through the kitchen with a rifle in his hand. I looked up and asked where he was going. He told me the rabbit was in the garden and he was going to shoot the rabbit! I immediately said, “NO!” “Please don’t shoot the rabbit, just shoo him away.” Jim assured me the rabbit would continue to come back. I thought about the rabbit and decided I had plenty of tomatoes for all of us. 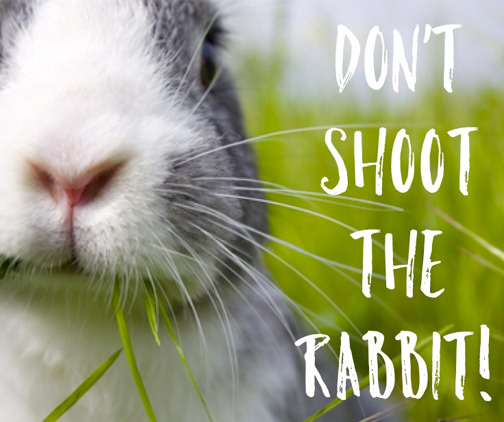 I did not want Jim to shoot the rabbit. While this means I may find more veggies on the ground with bites out of them, the tomatoes are just not as important to me as that adorable little rabbit. After all, it may be a mommy, it might have babies, and it is really cute! If I am willing to forgive a rabbit and share my garden with it, how much more should I be willing to forgive my brothers and sisters in Christ? Yes, they sometimes take from me what I do not want to give. It seems they can sneak around when I am not looking and take a bite out of me. What do I do? Avoid them, talk about them, cut them out of my life, or embrace their presence?